Dựa trên nền tảng truyền thông media qua điện toán đám mây (media cloud), chúng ta hoàn toàn có thể phát triển một giải pháp dịch vụ cho hệ thống khách sạn thông minh và đẳng cấp hơn – Smart Hotel. – Kiến trúc điện toán đám mây, hệ thông cloud có thể quản lý và điều khiển các thiết bị đầu cuối thông qua hệ thống upgrades phần mềm online, cập nhật phim thời gian thực, cập nhật thông tin khách sạn, thông báo tin nhắn tức thời, truy vấn người khách hàng quảng cáo, etc. 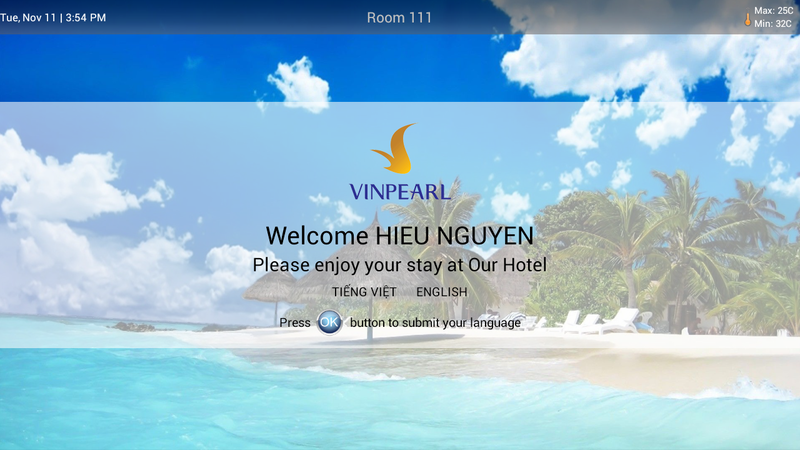 Once interaction with Smart Hotel system is initiated, guests are welcomed by “Welcome Screen” with their registered informations, and they start to select language. Besides, Smart Hotel-TV may send and show congratulatory messages for guests’ special events such as birthdays or wedding anniversary. Such warm greeting certainly bring first impression to guests. 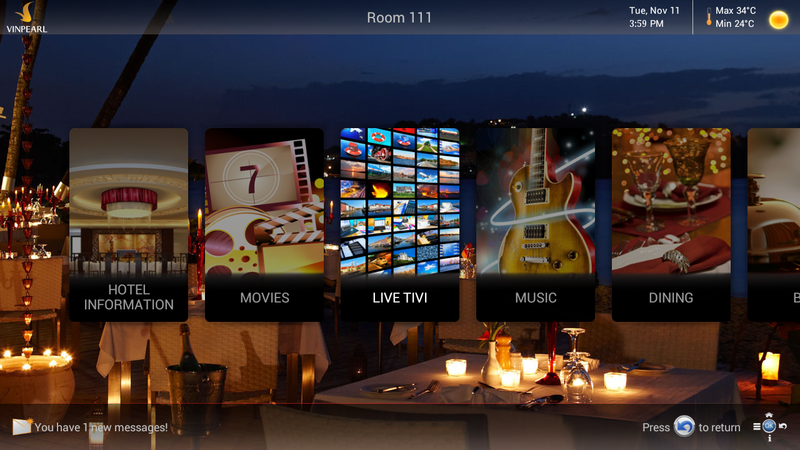 The Smart Hotel-TV system is designed with highly modern and user-friendly interface, consistently on all of the system’s menus. 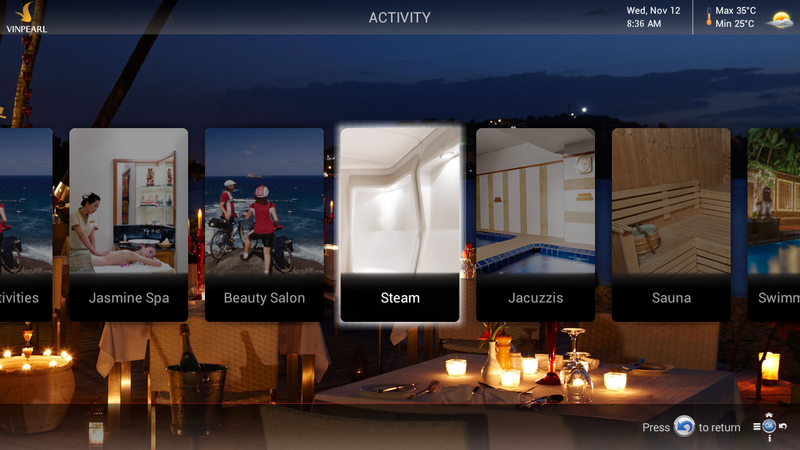 The main menu shows all the services offered, whose appearance positions and functions are customizable according to request by hotel/resort. In addition, the information bar on top of the screen displays the logo and information to promote the hotel/resort’s brand, as well as local time and weather information. 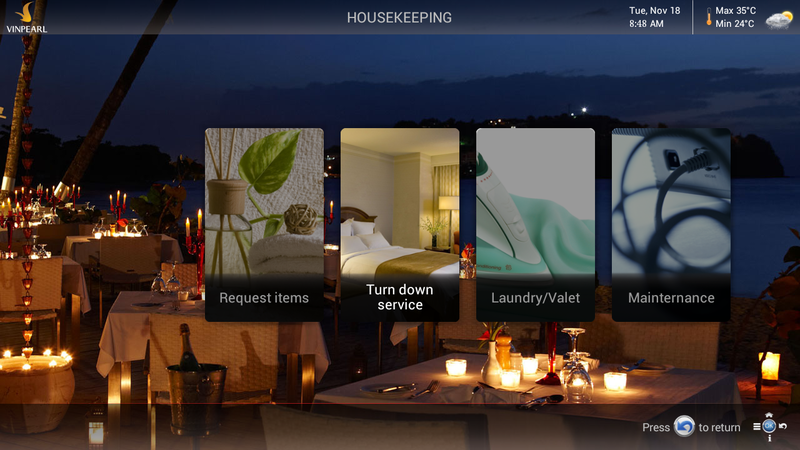 On the footer bar, Smart Hotel Solution allows to broadcast messages, event notices, promotion programs and other service information to your guests conveniently and effectively. The Smart Hotel system helps to reduce the cost of traditional form of advertising using leaflets, brochures etc. by broadcasting information directly on in-room TV screens. Guests are instantly informed with new restaurant menus, charity events, parties, conferences… being organized at the hotel/resorts. Hence, it helps to promote the hotel/resort’s brand to wide audiences which will have positive impact on the bookings and revenue. Provides an innovative channel for the guests to utilize hotel/resort’s services and utilities right on the in-room TV screens. 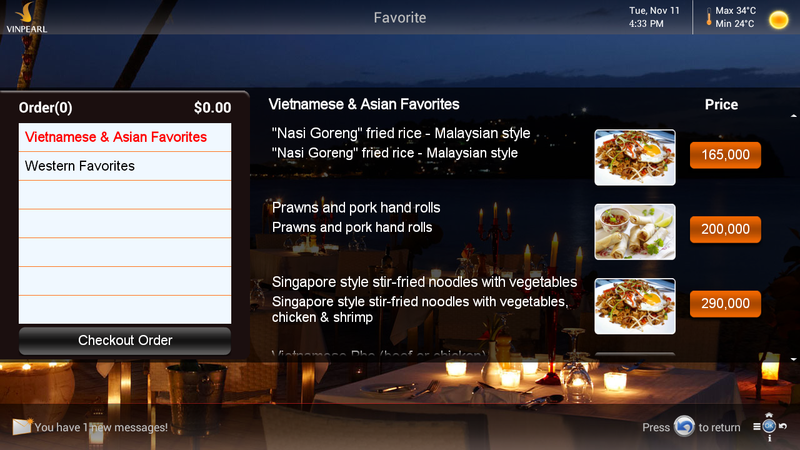 Room dining service can be much more satisfying with visual food, drinks and user-friendly ordering system. 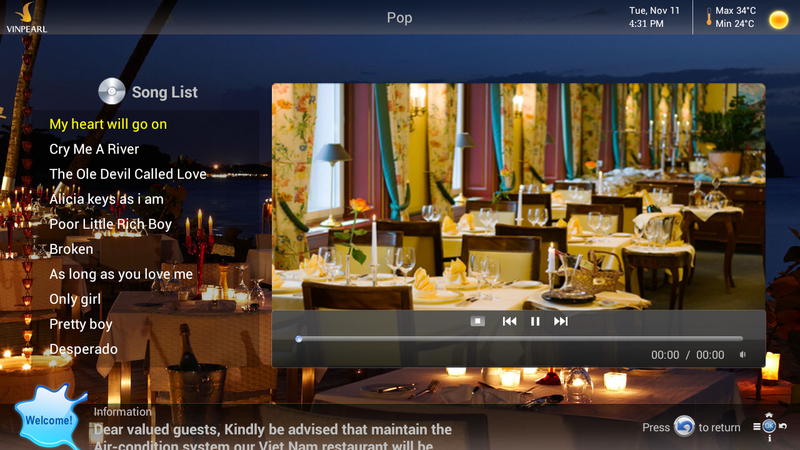 Restaurant reservations can also be made by hotel guests in their room via on-screen booking system, conveniently after the restaurant’s information and menus are presented with just a few interactions on TV. 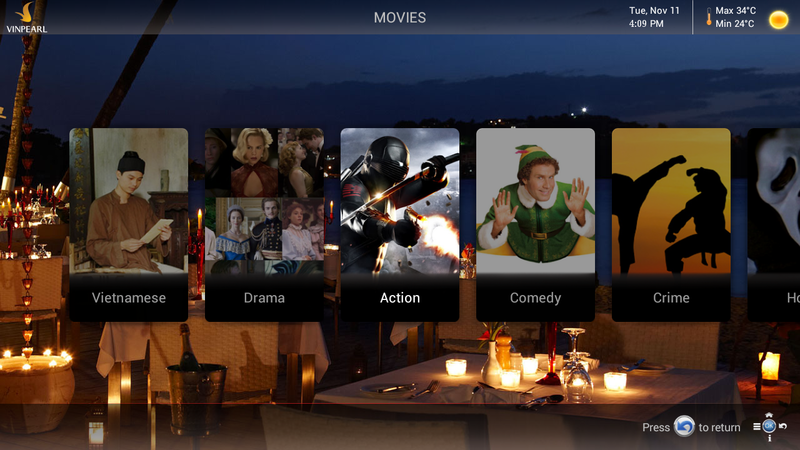 Delivers VOD entertainment service with full HD quality that satisfies strict guest demands. It offers a huge movie capability arranged in different genres and categories, in which your guests can conveniently search and play their favorite movies. The movie content is continuously updated with latest, hottest and blockbuster movies. 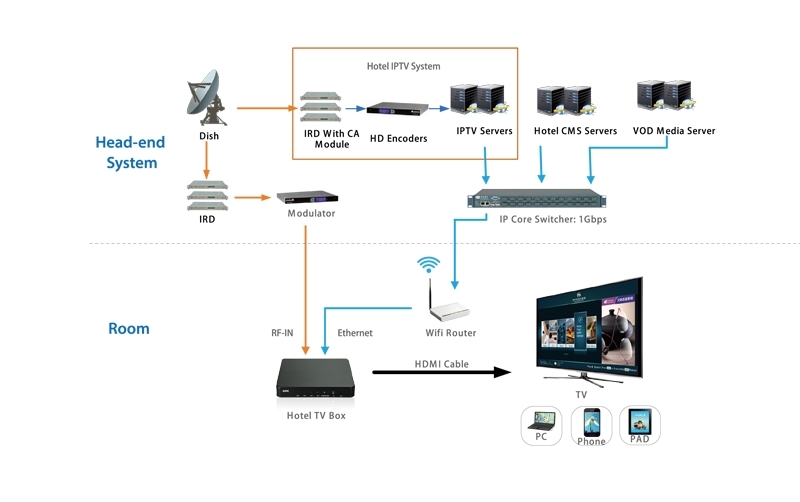 The billing system is also supported by Smart Hotel Solution which will boost the hotel revenue generated by VOD service. As being software development provider, we provide the customer with a variety of suppliers in order to enrich the TV content, meeting different preferences of hotel guests. Smart Hotel’s LiveTV offers more than 100 channels including local and international which allow guests to watch their favorite channels while they are travelling. In addition, Smart Hotel supports recording function when guests cannot watch more than one channel at once, so they won’t miss their favorite TV programs. 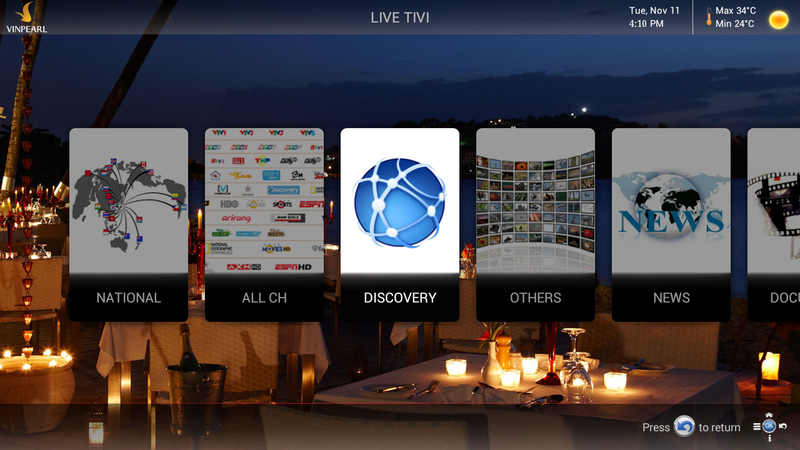 Our LiveTV is also equipped with a billing system that will contribute to the revenue stream when needed. Guests will be impressed by the variety of high quality music collection that meets the demand of even strict guests. The music collection is organized in different genres and categories that allows guests to easily search and play their desired music. New songs are updated continuously, keeping your guests entertained and comfortable. Guests can check mail, chat, web surfing on the TV simply through the wireless keyboard. They can read News, Youtube, Facebook, Twitter, Skype … right on the TV screen. 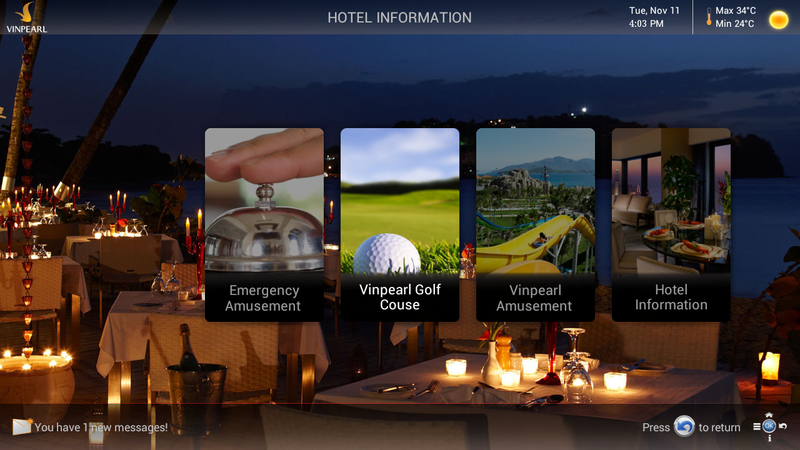 This screen updates the information about hotel’s activities such as sport competitions, special tours, promotional events as well as schedule, location where these activities are organized. Altering traditional way, guest can request, book room services right on the TV screen, including room cleaning, substitute bed coverings, add items, laundry, maintaining equipments,….